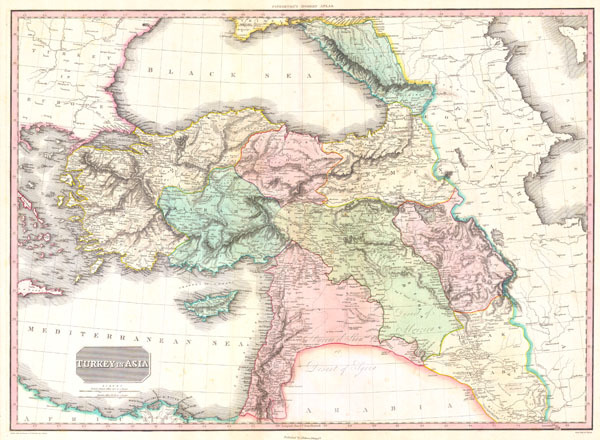 This is John Pinkerton's stunning 1818 map of Turkey in Asia. Covers the holdings of the early 19th century Ottoman Empire in Asia, inclusive of modern day Turkey, Iraq, Cyprus, Syria, Jordan, Israel, Palestine, Lebanon, Georgia, Armenia, and Azerbaijan. Area of coverage extends from the Aegean Sea to the Caspian Sea and from the mouth of the Nile and the Dead Sea to the Crimea and the Black Sea. This beautifully rendered map is truly a masterpiece of engraving, with mountain ranges, lakes, deserts, and rivers excited with such precision that the result appears almost three dimensional. Pinkerton injects astounding detail throughout with countless towns, cities, geographical features, rivers, islands and bodies of water noted. Names numerous important sites are named, these include Mt. Ararat, the historic ruined Armenian capital of Ani, the ruined ancient Roman city of Palmyra, the ruins of several castles, etc. Very good. Minor dampstaining in lower quadrants. Original centerfold. Blank on verso. Rumsey 0732.033 (British edition). Phillips (Atlases) 724. National Maritime Museum, 409. Phillips (America) page 806.